The Adam Sandler slide continues. Sandler, once a box office giant whose stock has plummeted in recent years, no longer seems capable of making a watchable movie. 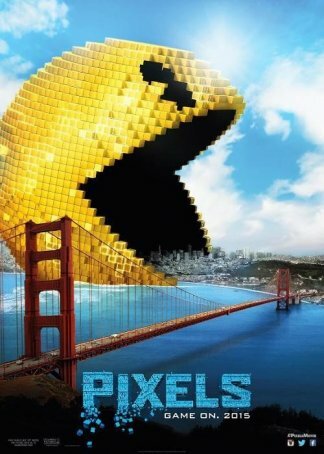 His latest, Pixels, an homage to the early 1980s video game craze, offers an appeal to nostalgia to go along with little else. The screenplay is arguably the most brain-dead high concept tripe to come out of Hollywood since the original Transformers. Sandler's brand of brash comedy is neutered to the consistency of diarrhea by the constraints of the PG rating. The "characters" vary from slightly annoying to unbearable - this is a film in which a viewer can be forgiven for rooting for the old video game icons to annihilate humanity. God help us if the best savior we can muster is Sandler. The premise for Pixels doesn't sound like it could support a feature film and it proves unable to. Aliens intercept video footage of a 1982 video game tournament and use giant recreations of Pac Man, Donkey Kong, Centipede, Galaga, etc. as part of a plan to conquer Earth. It's up to Sandler and his cohorts to take them on. Thinking about the logic of that may cause a brain aneurism. In fact, watching the movie may cause a brain aneurism if you can stay awake long enough. I'm not sure who thought this was a good idea and who greenlighted it. The film has zero appeal for anyone who isn't an (older) die-hard gamer. And how many (older) die-hard gamers are going to venture to a movie theater to see it? Worse still, the nostalgia allure is polluted by Sandler, whose mugging for the camera becomes as tiresome as his unfunny attempts to tone down his crass humor to family friendly levels. Even Kevin James, whom I normally like, is a square peg in a round hole, looking like Chris Christie searching for a buffet table. The expectation in some quarters might be that the special effects would at least give Pixels a degree of visual appeal. Unfortunately, the computer-generated imagery appears to be more cut rate than cutting edge. It's sloppy and garish - as if the graphic designer's Lite Brite had a seizure. Yes, the 8-bit representations populating early '80s video games were blocky, but it's possible to poke fun at this without making the results so ugly. (See Wreck-It Ralph for a primer on how to do this.) Paying to see this in 3-D is just throwing good money after bad. The film's so-called "action" scenes, which feature Sandler and co-stars James, Peter Dinklage, Michelle Monaghan, and Josh Gad using big guns to zap the invaders, are contrived to the point that it's impossible to become engaged. Everything is visual graffiti with no point. Even the worst movies usually make an attempt, vague and vain though it might be, to make sense but Pixels seems proud of its inanity. The "dramatic" and "romantic" sequences are so cringe-worthy that they made me long for the love scenes between Padme and Anakin. Sandler and director Chris Columbus might think they're honoring the classic console age. In fact, they're making everyone heave a sigh of relief that we have moved on. This is what happens when Hollywood starts out with a bad idea, miscasts all the roles, and executes everything badly in production and post-production. Game over.